‘Tis the season of the holiday party! We gather with family, friends, coworkers and neighbors this time of year to celebrate and renew the bonds that draw us together. Our meeting together is not only a joyful and rejuvenating experience but also one that can strengthen our minds. In wrapping up our series of ‘treats’ for our mind and memory, we’ll finish with the importance of socialization. Being with others activates our brain and memory like being alone cannot. It’s one of the traits of people who age well. In examining lives of those who maintain sharp cognitive function throughout their lives, one of the common threads was their strong social networks. The social activities we should all engage in do not have to be large gatherings. It can be a simple as meeting with an old friend for coffee, going for a walk with a family member or stopping to speak with a neighbor. Whatever and however you can be a bit more social, just do it! Being social engages our minds to think, discuss and engage with others. It increases our awareness and stimulates our minds and memories. Having an open mind to new people, experiences and places expands our mind and memory horizons. It will not only help us now but also later with more cognitive reserve to draw upon as we age. Cognitive reserve is the mental fitness we draw upon to help us withstand assaults on our brain later in life. We can build up cognitive reserve by continually learning and stimulating our brain but also by challenging it by being with others. Let’s make an effort to maintain our social ties with family, friends, neighbors or even new acquaintances this holiday season. It’s an easy and wonderful time to year to create a new habit of engaging socially. We will not only enjoy the season in a different and expanded way but also strengthen our mind and memories in the process. 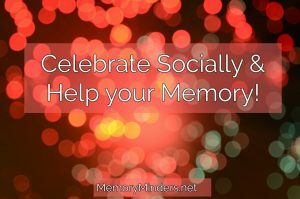 Give yourself the gift to celebrate responsibly this season with loved ones to create new memories and cognitive reserve! Thanks Kathleen!I love how you are engaging in many various activities to keep your mind and memory stimulated and especially how you encourage others to do the same. Keep up the great job!